Fluffy coconut rice alluded me for years. And finally, I’ve cracked it. This is super fluffy, none of the gluey coconut milk scum on the surface. Just like you get at restaurants! Truly fluffy coconut rice alluded me for years. I felt like I tried every variation possible, but when I lifted the lid, I’d stare at dismay at a layer of coconut fat scum on the surface of the rice which ended up coating all the grains when I fluffed the rice. Finally, I feel like I’ve cracked the secret code. And every since then, I’ve never looked back. Fluffy coconut rice every. single. time WITHOUT FAIL! 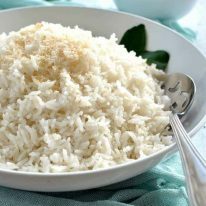 Rinse the rice – this is a must to remove excess starch. Most rice recipes on my site don’t require this. 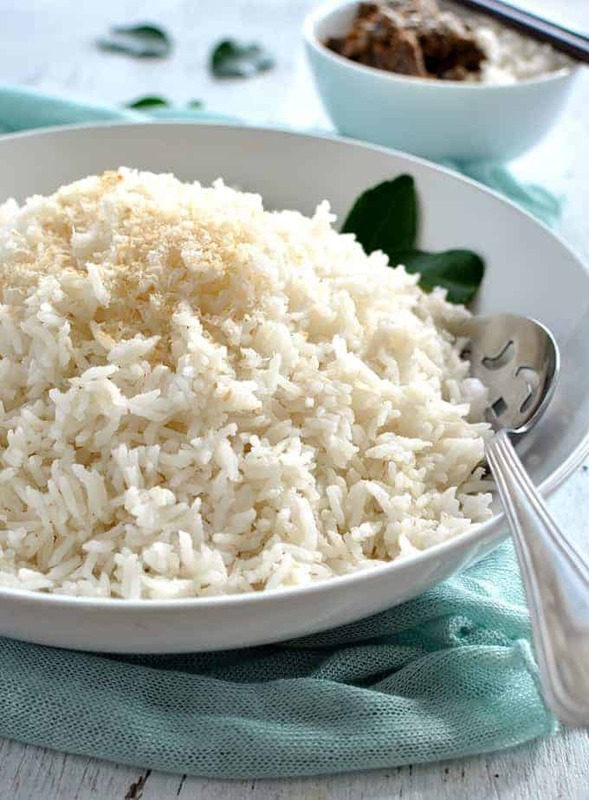 It’s essential for coconut rice because coconut milk is thicker than water so it can make the rice a gluey mess. Just rinse the rice until the water is pretty clear. It will never be 100% clear. Soak rice for 20 minutes – this essentially gives the rice grains a bit of a head start in the water absorption phase which is critical to ensure the rice is fully cooked because we cook the rice in LESS liquid than usual…. explained further in the next step! LESS liquid than usual! Normally, I religiously follow the 1 : 1.5 ratio to cook rice. That is, 1 cup of rice to 1.5 cups of water. But every time I did this for coconut rice, using a combination of water and coconut milk (increase / decreasing in my many iterations!! ), my rice always came out gluey! I was astonished to discover that for coconut rice, 1:1 is the perfect ratio. That is, 1 cup of rice for 1 cups of coconut milk + water combo! Can’t just use coconut milk – it’s just too thick, the rice can’t absorb it properly. It needs to be diluted with some water. I find the perfect flavour / rice texture is achieved by using 1 can (400ml/14oz) coconut milk with 1/2 cup of water (just over 2 cups) for 2 cups of rice. Bring to boil, stir ONCE, THEN lower heat and cover – This is quite key as well! I do not understand the science behind this, but suffice to say that bring to a boil before covering results in clean, fluffy rice grains. On the other hand, if you cover and keep the stove at a low temperature the whole time, you end up with a thick layer of coconut milk “scum” on the surface of the rice. And that, my friends, is the secret to fluffy coconut rice. It’s a lot of words. But don’t worry, actually cooking it is super duper simple! BONUS: There’s an even EASIER way to make fluffy coconut rice using coconut milk powder. I’ve popped that extra recipe below. It’s an extra because I coconut milk powder isn’t as common as coconut milk. While I always have coconut milk on hand, I don’t usually have powder! 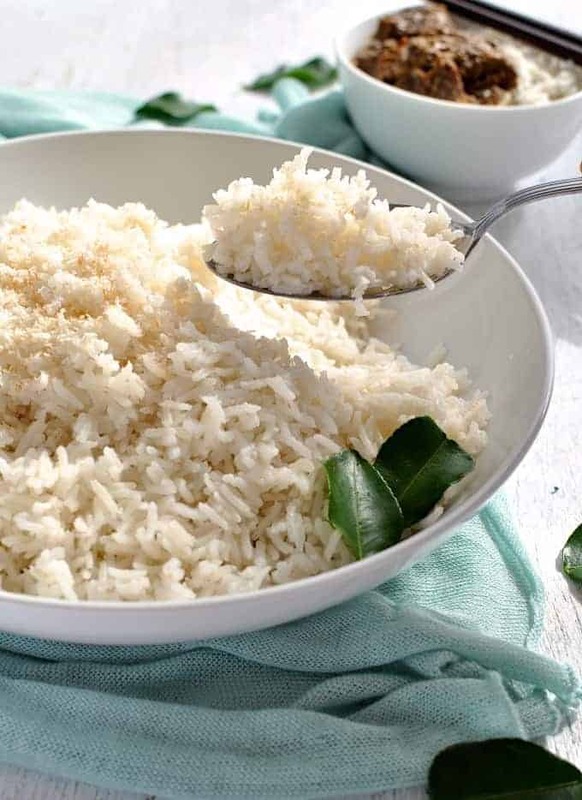 The base coconut rice recipe is one that will work for a broad range of cuisines, from Asian to Caribbean, tropical to Indian. To get a true Asian restaurant coconut rice, the secret is to add Pandam leaves. If you can’t find Pandam leaves, kaffir limes leaves also add a similar fragrance. This is a recipe for exceptionally fluffy, coconut rice! No gluggy coconut milk scum left on the surface, each grain is clean and fluffy. Make it Asian-restaurant style by adding pandam leaves OR kaffir lime leaves. Or finish with a sprinkle of toasted coconuts. Serve with: tropical, Caribbean, Indian and Asian foods. See recipe card below for COCONUT POWDER version (no rice rinse, no soak). Drain rice then soak in water for 15 minutes. Then drain. Add rice, coconut milk, water, sugar and salt into a small pot or large saucepan over medium high heat. Add pandam or kaffir lime leaf if making Asian restaurant style option. When the entire surface of the liquid is rippling (not just the edges), give it ONE stir (not more! ), place lid on and immediately turn heat down to LOW. Remove from heat, and rest, undisturbed, for 10 minutes. Fluff with rubber spatula. Garnish with toasted coconut, if using, then serve. 1. Rinsing rice - essential for this recipe as the rich coconut milk will otherwise make the rice gluey. This rice is best made with jasmine or long grain rice. Medium and short grain rice are too sticky which is made even stickier by cooking it in coconut. Basmati is also a good substitute. This recipe is not suitable for risotto or paella rice. It will also work with brown rice. 2. 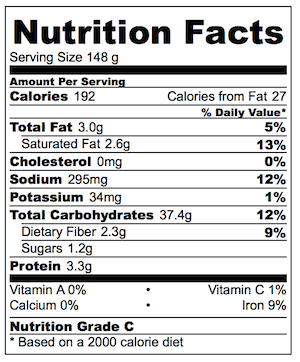 Coconut flavour is mostly in the fat so you get better coconut flavour using full fat rather than low fat. 3. Sugar - some restaurants make the coconut rice a touch sweet with the addition of sugar. Also, higher quality coconut milk is sweeter and richer than cheaper ones. So this is optional. It doesn't make the rice super sweet, it just adds a subtle touch of sweetness. I almost always include it. 2. Coconut milk powder is available in the Asian section or next to canned coconut milk in the canned vegetables of supermarkets. They typically come in packs of 3 sachets which are 50g / 1.75 oz each. In Australia, a box of 3 sachets costs $3. This coconut rice is like what you get a posh modern Asian restaurants. The rice is fluffy and light and has a special aroma from the kaffir lime leaves or pandam leaves. Coconut milk powder works even better than coconut milk because it's in powder form and has less fat, so the rice absorbs the liquid more evenly whilst still having that lovely coconut flavour. It also means you don't need to rinse and soak the rice, like you do for the coconut milk version (recipe above). This rice goes very well with most South East Asian dishes (in particular Thai and Malaysian) as well as tropical dishes (Hawaiian, Caribbean, Jamaican). Combine all ingredients in a saucepan over high heat. Place lid on. When it comes to the boil (watch it, you don't want it to boil over), turn down the heat to low / medium low so it is simmering gently. Leave it to simmer for 12 to 15 minutes until all the liquid has been absorbed. Remove from heat and rest for 5 to 10 minutes. Fluff with fork. Garnish with toasted coconut, if using, then serve. 1. Rice - This rice is best made with jasmine or long grain rice. Medium and short grain rice are too sticky which is made even stickier by cooking it in coconut. Basmati is also a good substitute. This recipe is not suitable for risotto or paella rice. It will also work with brown rice. No need to rinse or soak rice when using this coconut powder method (with coconut milk - see recipe above - rinsing and soaking is necessary for fluffy rice). Hi Nagi, can you cook this in a rice cooker? Just made this with your Thai Mango Chicken Curry. Whoa! I really try my best to avoid rice dishes (don’t even eat rice with take out curry). I guess I’ve never liked the taste or texture, but this is amazing!! I was eating it on its own and couldn’t stop.. Thank you for yet another stunning recipe. Woot! I’m so glad you loved it! I returned to use your recipe and it has changed! Your instructions for using coconut milk powdre have disappeared! There is still a mention of the coconut milk powder at the end of the recipe but the detail has gone. Please put it back, even as an alternative to tinned mile as it worked beautifully when I used it other times! Don’t mess with perfection please! Hi Liz, I’ve now updated the recipe to include the old method as well (I didn’t think people were using the powder) but I’ve mastered it with coconut milk and think it’s well worth it! I see that you have changed this recipe. It used to be made with coconut powder. I bought some, but hadn’t yet tried it. Is this a better version? Hi Kerrie, I’ve now updated the recipe to include the old method as well! OH, I’d needed this recipe, too! I’d had some of the issues in the past that you had mentioned having! I’m sure this will help greatly when I next make it! If you are growing a kaffir lime tree, leave the fruit to turn yellow and you will get the most amazing lime juice. I found it helped if I sifted the coconut powder first (I also sifted the salt and sugar together with it as well, because why not). I tried this twice twice last night – as the first batch burnt – I followed the instructions exactly per recipe and put it on very low heat. I tried again, and the second time the rice got stuck to the bottom of the pan so I lost half of it – this was in a non-stick pan on very low heat again. It also took longer to cook, the rice was still crunchy but all sticking to the bottom at the same time! Any idea what went wrong? I tried this but used coconut water with the coconut pwd. 1 T of sugar. It was amazing. Best one I have ever made to date. I did it in a Zojirushi rice cooker. 2 cup rice (rinsed) using rice cooker measure (less than an actual cup) and 2 cups of coconut water as the rice cooker line showed that level for liquid. It could have used a bit more liquid. Loved the taste. Not sticky at all. THE best coconut rice recipe! No contest- awesome. Really easy to follow instructions, and the taste! Oh WOW! Hi Nagi, will this recipe work just as well with my favourite sticky (glutinous) rice? Hi Nagi! I’m about to attempt this tomorrow with some friends! I found the Coconut Cream Powder packet at my local asian grocery, but I was wondering if you put the powder in dry (into a rice cooker) and mix it up with the water OR if you need to follow the packet instructions to get ‘coconut liquid’ PLUS adding the 1 and a 1/2 cups of water? On the packet, it says to mix 150ml of hot water for a thick consistency of liquid or 300ml of water for a thin consistency of liquid. Hi Nagi, I came across your blog through a search of great caramel slice recipe. My kids are never get enough of that and always want for more while Mommy is a penny pincher. We managed to make it last weekend and it was a hit! Thanks! Talking abt coconut rice, we have a version in Indonesia called Nasi Uduk. Apart of coconut milk/cream/powder and kaffir lime leaves, we also add crushed galangal, Indonesian bay leaves (daun salam) and lemon grass stalk. Now I can tell you how I adore the fragrance you that lingers in the kitchen for days whenever I cook this aromatic dish. I know some nasi uduk sellers also incorporate sauteed garlic and shallot into their coconut rice. Tasted sooo amazing on its own. I have been looking for a way to make Coconut Rice as good as that at The King and I here in Edmonton and this is leaps and bounds ahead of anything else I tried. I didn’t bother to source the coconut milk powder, just used canned, but adding the Kafir lime leaves that I had in the freezer and that little bit of sugar made a HUGE difference! Thank you!